Resources not provided for download are available through the Eppley Institute, please contact our office for more information. Indiana’s SWAP is a habitat-based model that incorporates all fish and wildlife species in the state. It identifies the condition of Indiana’s wildlife species and habitats, the problems they face, and the actions needed to ensure the long-term viability of these species and habitats. Since conservation efforts occur at many levels (e.g., local, state, and federal), it is imperative to unite the entire Indiana conservation community by focusing on strengthening partnerships to accelerate conservation in the state. The input of all Indiana’s 600+ identified stakeholders is vital to the success of the 2015 SWAP. The Eppley Institute developed the following recommendation report to inform the 2015 SWAP process. In 2013, the Bureau of Land Management (BLM), one of the participating agencies in the Hands on the Land (HOL) program, released a new National Strategy for Education, Interpretation, and Youth Engagement, which outlines several major goals, including expanding the BLM’s HOL program. The BLM’s Division of Education, Interpretation, and Partnerships, the HOL Working Group, and the Eppley Institute collaborated on the design, development, and production of a desk guide for HOL sites, which is intended to help BLM site coordinators expand and enhance their HOL programs and to establish HOL as the foundation for the BLM’s formal environmental and heritage education programs. The purpose of this training proposal and communication plan is to provide the BLM with recommendations for implementing the desk guide and expanding the HOL program. The National Park Service (NPS) Human Resources career field recently updated the competencies for the various levels of employees in the career. 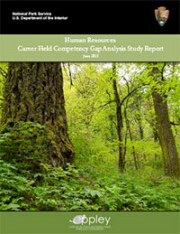 The HR Gap Analysis methodology will utilize a five-stage approach to determine gaps in these competencies. The Five stages include determination of the research methodology; development of survey instrument; collection of data; analysis of data; and reporting of findings. The results from the surveys will be used by the NPS to prioritize and design training events to meet the needs of the human resource professional in the NPS. City of Wabash Park Department Master Plan 2010-2014. 2010. A five-year master plan designed as a visioning document to set strategic directions for the City of Wabash Park Department.